This week was another short week due to traveling yet again. I took it as an opportunity to make some shop changes to put a little more emphasis on being able to easily move around and move from tool to tool in the shop. The major thing to go was my plywood cart. It just took up too much valuable space so it had to go. The extra space it freed up is more valuable right now than the convenience of storing a lot of plywood on hand. 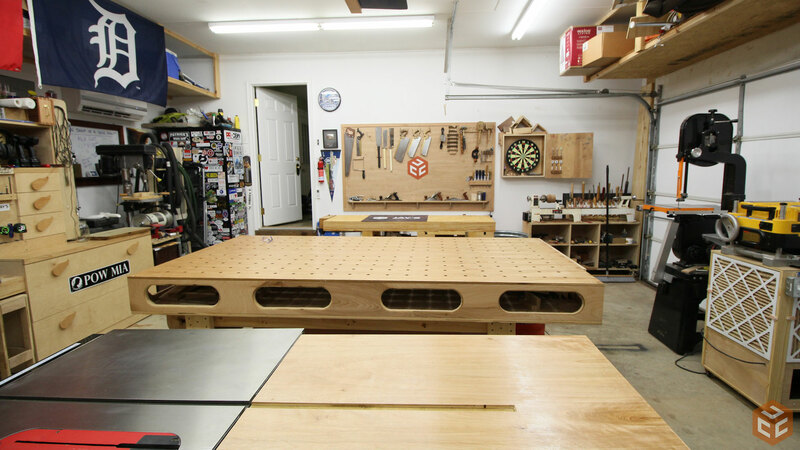 The only item I added to the layout is a 4′ wide by 3′ long dedicated outfeed table. It’s a simple design that Nick Ferry, April Wilkerson, and myself came up with on our Wisconsin collaboration trip. We made a video on it while there so I didn’t bother recording this build process. That video will be out soon. 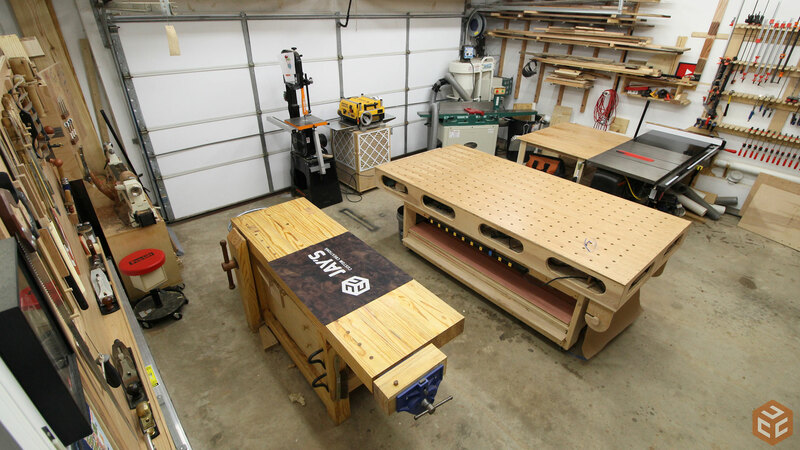 The major benefit from this slight shop layout change is that I now have more room dedicated to me moving around in the shop and I also now have access to all four sides of my 4′ by 8′ assembly table. Watch the video or check out the following pics for the changes. Well your new arrangement looks good. Looks like a good work flow set up. But there would be one thing I would change. 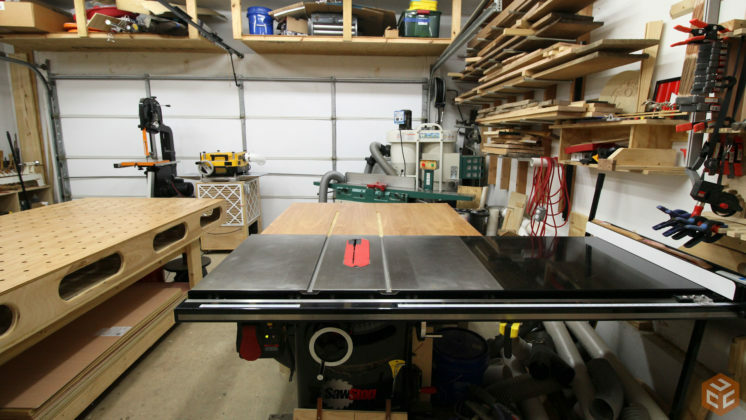 I think that your assembly tables (although very nice) are way to large for your size garage. 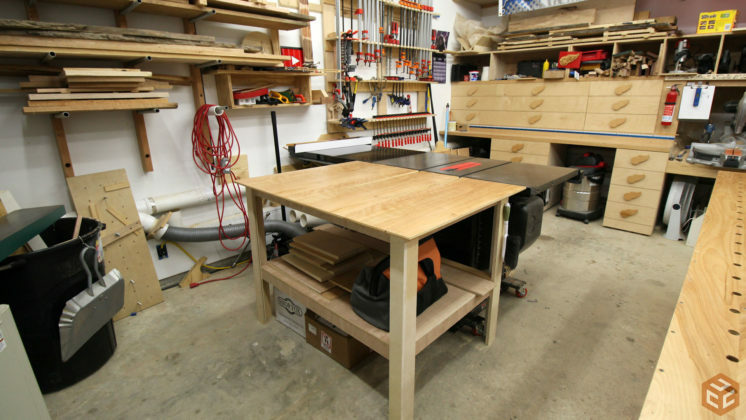 I think that the if someone is going to build shop assembly table, that they should consider what they might be building (size wise) and have a workbench to accommodate those types of projects. 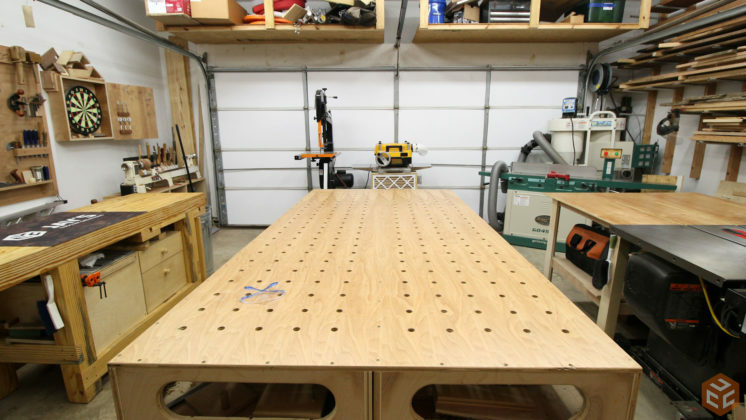 In car and 1/2 garage I have a workbench that is 24×48, that has a set of legs attached to both sides that slide out to increase the the size. I have 2 extra tops that set on the 2 pullouts. Each side can be pullout by them selves. So it sits up against a wall and if I need more space I just pull one side out and make lay the top on it’s bigger. So what is your plywood and lumber storage going to look like then? I would agree that is a big part of my space issues. I won’t buy plywood unless needed for a project. My lumber hasn’t changed in a year or two. 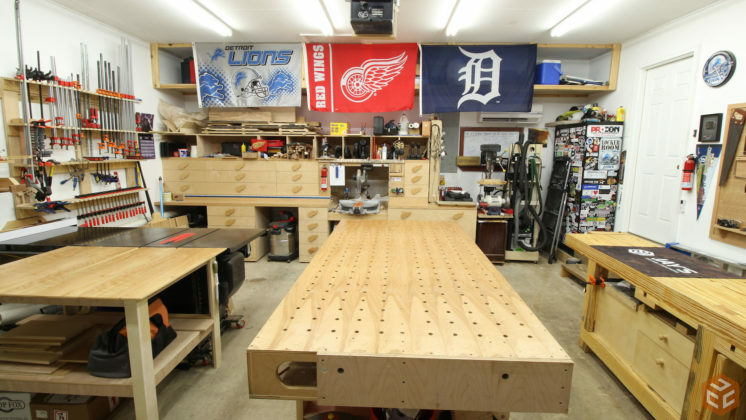 I agree with Jeff to a degree, assembly table seems large (with the addition of heavy duty work bench) but If assembly table was made large enough to serve as full sheet plywood storage could justify the space. You could decide space under table in half for 1/2 & 3/4″ sheet to hold 4-6 sheets each. The only issue might be having enough space to easily slide sheets in and out of storage space with table saw, assembly table and work bench being fixed. 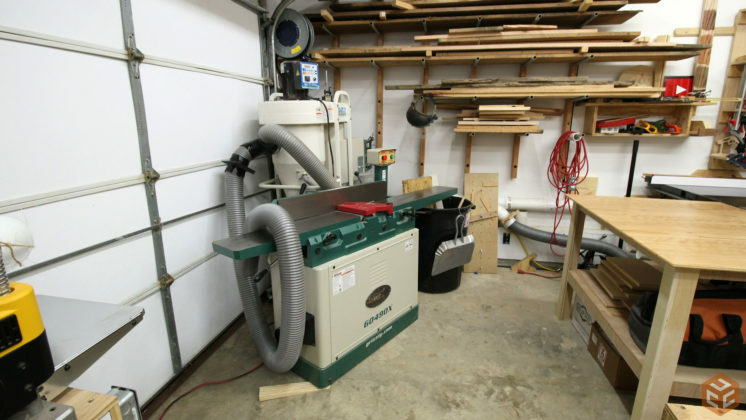 Jay, can you easily cut/work 8′ sheet of plywood on table saw, in new location? 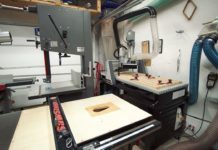 Have you thought of putting your clamps inside your assembly table? 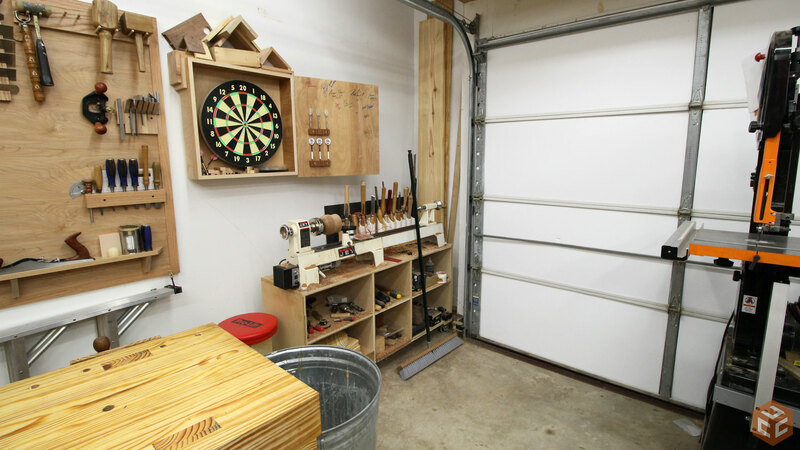 Do you have space outside for a lean-to style plywood storage shed? The owner of our local Woodcraft here in the SF Bay Area showed me a design that works well for him. You have a lot more rain / humidity there, not sure if that would be a problem. Forgot to say that it looks like a BIG improvement, nice work! Humidity would be a problem. And also no room in my current shed. The removal of the plywood cart and other changes are the reason that no one should blindly follow a content provider’s plan. 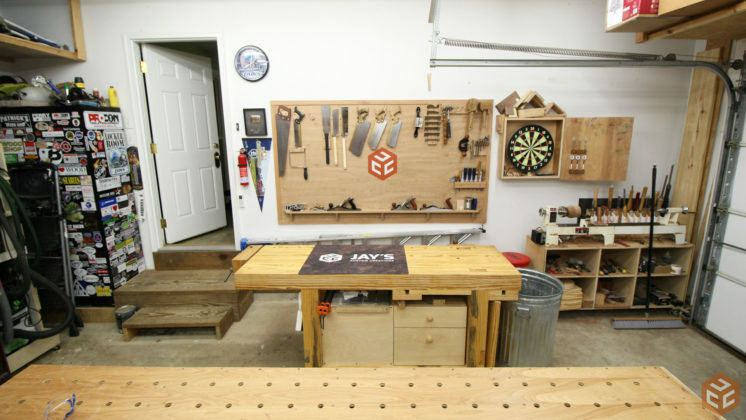 Make your own shop useful for you. Where did the cabinets go with all the stickers, I thought they look cool. 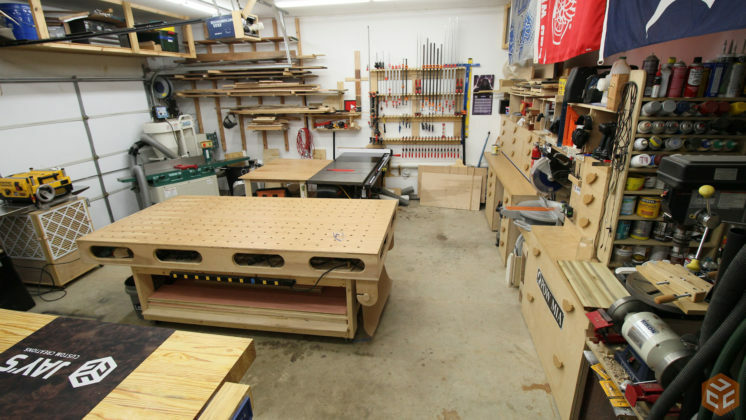 The shop layout looks great. Just spent a week dry walling my shop ceiling after 40 years of looking at trusses. Painted the shop bright white and installed 9 LED shop fixtures, what a difference. Thanks Jay. The sticker cabinet is still there. The shop looks awesome. I do have one question for you. Have you ever considered reducing the assembly table size and combine the workbench to the end of the assembly table? Hey John. 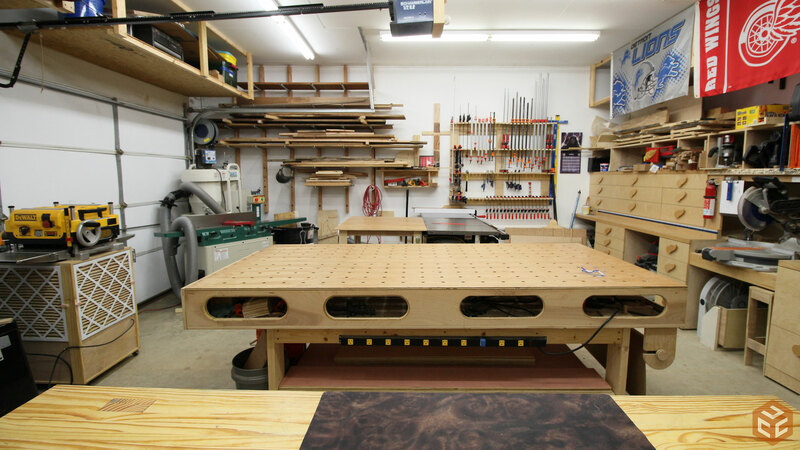 I’ve considered reducing the assembly table if room was an issue. The way I have it here I don’t think it is but I have no problem going that route in the future. 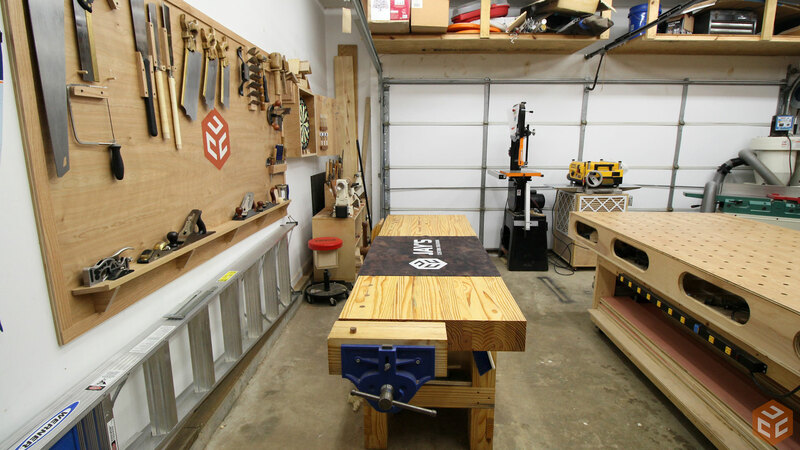 I’ll never put the workbench against anything if I can help it. It’s really handy to access all sides of it. I’m new all these videos (been watching for the last month or so) and have gotten so much out of your videos! Actually, my shop was in a fire in January of this year and now I am updating all my tools, for my new shop. A lot of the tools I have updated already are the same as yours. I really like the miter saw station you and Wayne Brown have built and I am designing mine like you guys’ shops! Thanks so much for all the wonderful ideas you have brought to the public! I have to say that you, April Wilkerson, Nick Ferry, and Izzy Swan are my favorite (although, I’ve seen more of your videos than anyone elses). I think your new shop layout is great! 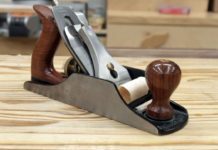 Keep up the great woodworking! Your calander is a bit off. 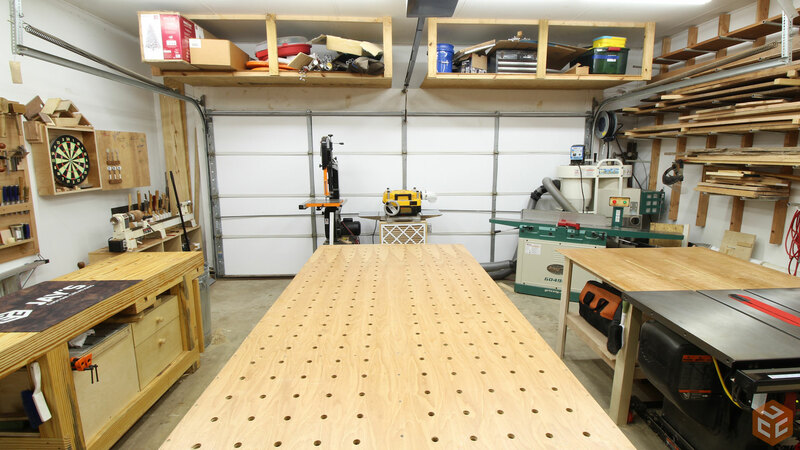 Assembly table needs depend on type of projects made. I love yours, and that will be my next project. I need to build some large face frames for a cabinet project, and my not having a true flat surface, just won’t get it done. I think your new shop layout looks great. Can you talk a bit about your air conditioning? Being from Michigan now living in Texas the heat keeps me out of my shop. 18k BTU QuietSide mini split with heat pump for winter as well. No insulation in the garage walls or ceiling. Garage door has weather stripping outside to seal it off when it closes and the door is insulated but it does face north so no direct sunlight. 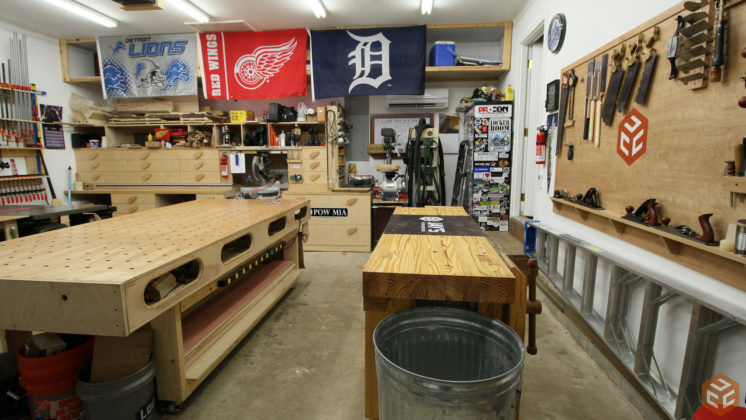 The shop is 20.5′ x 20.5′ with 10′ ceilings. The AC can cool the shop to 70 with no problem and pull the humidity out at the same time. BEST improvement I’ve made to any shop environment I’ve had. 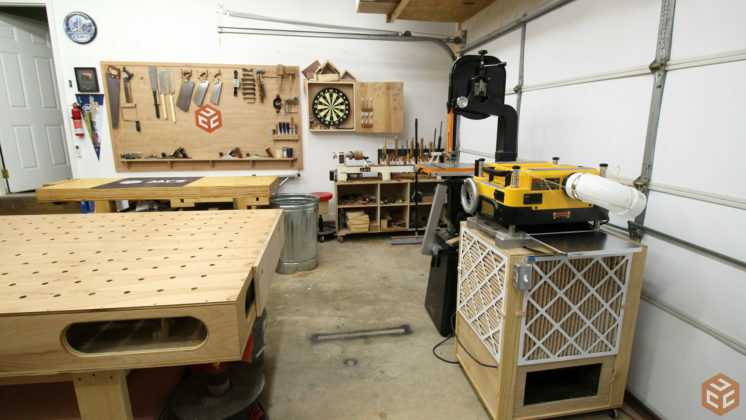 Just how big IS your workshop? 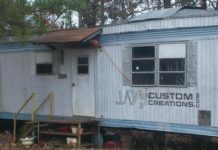 I am going to build a shop and I would rather it be a little too big, than a little too small. Yours looks pretty good, so I could start with a template with your dimensions.